Wonderful staff. Great views. Perfect location. Will return! Very nice stay starting with checking in. Lorria Lee was amazing. She was incredibly helpful during our entire stay from knowing our names the next day to giving us wonderful referrals to food, Art galleries and shopping. Restaurant staff were always attentive but not intrusive. What a wonderful way to celebrate our 25th anniversary and 50th and 60th birthdays. We look forward to our next visit. Nice location near the marina and Waikiki sights. Great restaurant. It is within walking distance of many locations. Housekeeping was poor with 4 errors in a week. The room lacked common amenities like a microwave oven. The toilet paper was as cheap as a highway rest stop. Nice friendly staff. Beautiful pool and scenery setting. Great hotel. Not too far from the beach or Ala Moana Mall. Great staff and rooms and restaurant are very nice! Everyone was very nice and helpful. Felt like home away from home. Loved our room very clean. Maybe they just need better food at the clubhouse, it looked like leftovers from the buffet. It wasn’t worth it for the most part cause Wer our most of the time . From the time we arrived until we left, every staff member greeted us with a warm smile and went above and beyond to help us. I would recommend Prince Waikiki to anyone. No beach but the hotel was clean, comfortable, and staff was great. Would definitely stay there again. The staff iate pleasant and helpful. I would stay here again! I would highly recommend the Prince Waikiki! It is a beautiful modern and airy hotel located further down Waikiki near a small harbor. Only about a 5 minute Uber ride away from the bustling shopping area of Waikiki. The staff and front desk reception are incredibly gracious, helpful, and friendly! Their lovely hospitality is so inviting that you definitely wish to return. Upon check-in, we were greeted with fresh ice cold wash clothes to refresh ourselves. Our room was super clean and very inviting with a lovely view of the harbor and windows that open wide. The beds were very comfortable and inviting with cool crisp white linens. They also provide you with larger-sized shampoos and soap -- which definitely make more sense. A great plus is that their pool (next to their infinity pool) is open 24 hours a day! And is great for families as children are welcome in both pools. That makes a difference not to have the pool close early. It is a great location as well if you are interested in parasailing as that is available just a short 5 minute walk to the harbor behind the hotel. The hotel has a beautiful store in the lobby which offers gift items and delicious snacks and cold drinks. We were impressed and loved the fresh turkey sandwiches and also fresh sushi packages. Also in the lobby is a fabulous open cafe that has coffee, pastries and sandwiches, cold juices, and makes fresh smoothies and acai bowls. The hotel also is home to several beautiful restaurants! We stayed for 4 nights and Prince Waikiki made our trip to Honolulu complete! Everyone was so friendly and helpful. Excellent facilities and services, clean, great value, and more. Would definitely recommend this hotel! Very nice rooms with excellent Ocean views. The hotel staff went out of their way to help us find day trips to various places within Oahu. We loved our stay at prince Waikiki. Its close to beaches, mall , park and in good area . Service was good and we r happy ! The view was amazing. The coffee shop located in the lobby serves the best lattes. Great location. It was amazing! Super clean! Went our our honeymoon and can't wait to stay there again! Make sure your room is really cleaned not a quick clean. Located in Waikiki, Prince Waikiki is adjacent to Ala Wai Yacht Harbor and within a 10-minute walk of other popular attractions like Ala Moana Beach Park. This 563-room, 4.5-star resort welcomes guests with 2 outdoor pools, 2 restaurants, and a 24-hour fitness center. Enjoy dining at one of 2 onsite restaurants including 100 Sails Restaurant, which specializes in sushi. Satisfy your hunger without leaving your room with 24-hour room service, or quench your thirst with a beverage at the bar/lounge or coffee shop/café. Buffet breakfast is offered for a fee each morning from 6 AM to 10:30 AM. An LCD TV comes with cable channels and pay movies, and guests can stay connected with WiFi. The bathroom offers hair dryers, free toiletries, bathrobes, and slippers. Other standard amenities include a refrigerator, a coffee maker, and a safe. 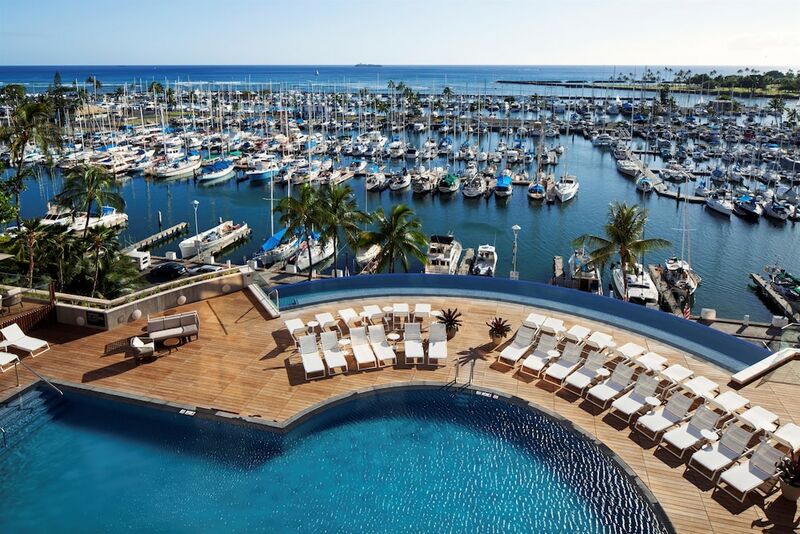 Renovated in 2017, Prince Waikiki offers 2 outdoor pools, a 24-hour fitness center, and free WiFi in public areas. Parking is available for USD 25.00 per night (USD 33.00 per night for valet parking), and there's also a free area shuttle. The 24-hour front desk has multilingual staff ready to assist with luggage storage, tours or tickets, and dry cleaning/laundry. Other amenities at this luxury resort include conference space, a computer station, and a library. 100 Sails Restaurant - Restaurant specializing in sushi. Open select days for lunch and dinner. Katsumidori Sushi Tokyo - Sushi bar specializing in sushi. Open select days for lunch and dinner. Bird of Paradise - Restaurant serving brunch, breakfast, lunch, and dinner. 2 outdoor swimming pools are on site, and the resort also has a 24-hour fitness center.